Norcal Ag Service delivers bulk organic composts and compost fertilizers, such as organic greenwaste compost, cow manure compost and composted chicken manure by the truckload to Yuba City, Sacramento, Merced, Modesto, Livermore, Napa Valley, Sonoma, Lodi and all communities throughout central and northern California. Compost orders are delivered by end dump semi's or high side transfers when needed. 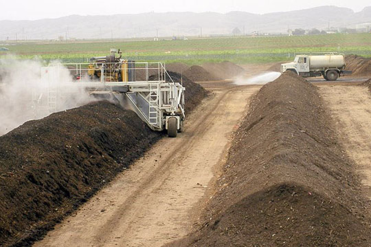 Norcal Ag Service provides growers two types of organic certified greenwaste composts. Inputs from lawn, shrub and tree clippings make up over 95% of the material used to produce this type of compost. Screened at "3/8 inch and processed through a "windrow" composting technique. When the windrow is formed microorganisms consume oxygen (aerobic decomposition.) As oxygen is used up aerobic decomposition slows down. Aeration is provided by mechanical turning to add oxygen and replenish pore space within the settled medium. This promotes air movement through the windrow. Temperature increases due to microbial activity in the windrow. The temperature increases to 40-60 C and generally is maintained for several weeks. As aerobic decomposition slows the temperature drops off. When the aerobic decomposition has slowed the curing phase has begun. Oxygen usage is so slow the windrows don't need to be turned anymore. As the temperature drops to that of ambient air the compost is done. We also do custom blending with gypsum, limestone, sulfur and other soils and amendments....just ask! You tell us what you need and we'll get it to you.